Edmodo is a social learning system for students, teachers, districts, and schools. It was launched in Chicago, Illinois, and was created to bring education into the 21st century. Today, Edmodo is located in San Mateo, California. It has become one of the leading K-12 social learning networks in the world, dedicated to linking all learners with the resources and people they need to reach their full potential. In addition to modernizing the way educators interact with students, Edmodo also allows them to engage students throughout each class. Using this platform, you will get access to all the tools you need to give your students a more exciting learning experience. Other than helping you facilitate online classroom discussions, this software also has great gamification tools that can help you motivate your students to participate more. Schools and Districts: Build your collaborative network. Become an Edmodo school or district. 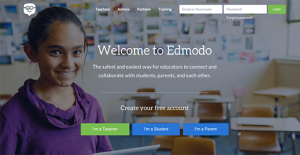 Activate your free admin account: Connect all teachers, parents, students, and administrators in your school or district through a secure Edmodo web address (URL example: EdmodoHigh.edmodo.com). Build a network of communities: Support collaboration in schools, classrooms, and across your district to improve professional learning networks, supported by a global community of educators. Accelerate learning goals: Easily deploy and manage digital assets, and track usage patterns and student progress on your school or district dashboard. Gauge Student Performance: The only way to find out if you are effectively getting through to your students is by measuring their progress. With Edmodo, you have access to a unified database that lets you check the grades and the participation level of your students. In addition to that, this has a feature that lets you monitor the reactions of students to certain activities and classroom discussions. This way, you can easily pinpoint which aspects of your lesson your students are having a hard time with. More Learning Experience: While Edmodo already has a complete suite of online learning tools, it still offers a highly customizable and extendable interface. This allows users to integrate applications and widgets into their lesson plans in order to provide an even more engaging learning experience for students. Connect to resources: On Edmodo, teachers are at the center of a powerful network that connects them to students, parents, administrators, and publishers. This network offers top rate resources and tools, providing the building blocks of a high quality education. Since each company has unique business needs, it is prudent for them to refrain from searching for a one-size-fits-all faultless software solution. Needless to say, it would be futile to try to find such a system even among popular software platforms. The smart thing to do would be to list the various important aspects that require consideration such as main features, finances, skill levels of staff members, company size etc. Then, you should do your groundwork thoroughly. Read some Edmodo reviews and investigate each of the other solutions in your shortlist in detail. Such exhaustive groundwork can make certain you reject ill-fitting applications and select the solution that provides all the features you require for business success. How Much Does Edmodo Cost? We realize that when you make a decision to buy Learning Management System - LMS it’s important not only to see how experts evaluate it in their reviews, but also to find out if the real people and companies that buy it are actually satisfied with the product. That’s why we’ve created our behavior-based Customer Satisfaction Algorithm™ that gathers customer reviews, comments and Edmodo reviews across a wide range of social media sites. The data is then presented in an easy to digest form showing how many people had positive and negative experience with Edmodo. With that information at hand you should be equipped to make an informed buying decision that you won’t regret. What are Edmodo pricing details? What integrations are available for Edmodo? If you need more information about Edmodo or you simply have a question let us know what you need and we’ll forward your request directly to the vendor.